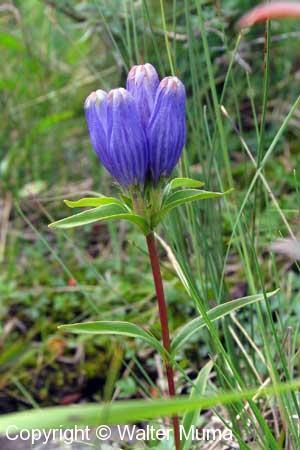 Distinctive features: Typical closed gentian type of flower. Narrow leaves. Flowers: Summer; Blue/Violet; 4 parts (petals); Blue. Closed. Habitat: Forests, Wet Areas; Damp woods and wet meadows. Photographs: 15 photographs available, of which 5 are featured on this page. SCROLL DOWN FOR PHOTOGRAPHS. The whole plant. I haven't yet found this plant in Ontario, although it does grow here. These photos are of specimens along the Eastmain River, off the James Bay Road in northern Quebec (see the James Bay Road website for more info about this region). The flowers. They never "open". Somehow insects know how to get in. The flowers are at the top of the stem. Top view of the flowers. Showing the narrow leaves, and their relative size.